The centre table of this nest of three is, unusually, a hollow box. Contrasting ends on all the tables accentuate the leg design, these being all hollow box sections. The main surfaces are all 6mm standard birch ply, but the ends can be your choice of timber. My local yard does a modest selection of boards and offcuts and I went for keruing, a mahogany-coloured timber which is heavy and slightly sticky but quite easy to work. The mitred corners are joined by an 'L' shaped solid piece which could be of any decent hardwood such as beech, but I chose jelutong which is light in weight and, again, easy to work. All the tables are 400mm (15 15/32in) deep, so if the solid facings are 20mm (25/32in) thick with 10.5mm actually exposed each end - for more detail see Routing Rebates, described below - the birch ply panels will all need to be 379mm wide with the exception of the front and back panels on the small 'box' table which are 425 x 155mm (16 25/32 x 61/2in). Draw out roughly on paper the sizes you will need. One ply board will not be quite big enough, and I used an offcut of interior ply for the underside of the two outer tables, these not being visible. Make up a cutting list of panels, cut the 8 x 4 board into two 379mm strips, cut the two facing pieces for the 'box' table off the third strip, then reduce the remaining strip to 379mm wide. Referring to your list, cut out all the panels as economically as possible but overlength by say, 15-20mm (9/16 -25/32in) to allow for cutting the box section mitres and trimming to length. Cut the two table underside panels from the 6mm ply offcut. The contrast timber for the leg facings can be cut from either 25mm (1in) or 50mm (2in) nominal-thickness board. Buy more than you think you will need as it soon disappears! First of all, machine the face and edge of all pieces on the planer table, making sure the fence is set square. Secondly, machine to thickness until finished size is reached. The solid components for all the tables are the same width and thickness although the pieces for the 'box' table have a slightly different rebate arrangement. You will need other strips from any suitable hardwood to infill the bottom of each leg; because of the need to check the actual sizes needed, these should only be machined to width once the table box sections have been assembled. Having produced a stack of identical squared stock, set up the router table for machining the rebates. All rebates will be 6 x 9.5mm, this latter dimension being a standard rebate cutter depth. Use some offcut material to do test cuts and check the result using a piece of the birch ply to ensure it will lie flush in the rebates. The leg rebates are straightforward but the matching pieces that go on the 'box' table have a rebate for the facings; this is turned in a different plane by 90 degrees. Take care to mark which way round you are doing each rebate to avoid a mistake! In fact do these pieces first so that you may be able to use them as leg facings if you get the rebate wrong. Now cut all solid sections to match the overlength panels; each of the leg and top box sections will be assembled separately ready for mitring. Apply PVA glue all along the corner of each rebate of the two solid components and assemble with the two matching panels to form an open box. Use plenty of clamps and cramps but avoid applying too much pressure as that would deform the box shape. Check everything is tightly together and, importantly, square, then wipe off surplus glue and leave to set. As there are six box sections plus the centre 'box' table, these sub-assemblies will take some time unless you own loads of clamps. 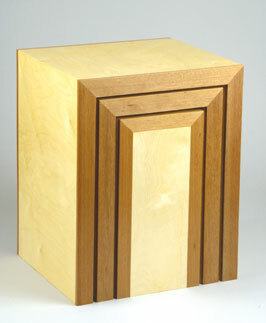 Once all the box sections are dry, do the mitre cuts for the facing panels on the centre 'box' table. Glue and assemble one face panel at a time, ensuring all the mitres are tight together. Then clamp up carefully, ensuring that the solid sections stay flat with the ply; check with a steel rule. Assembly of the centre table depends on accurate 45 degree mitres on the side and top ply pieces so do check your mitre cutting setup first. To achieve the long mitre cuts you will need a pullover saw or a tablesaw. When satisfied that you can cut the mitres accurately, cut them on the actual ply panels, leaving the sides overlength at the bottom of the table as these can be trimmed off later. Now glue the 'box' table parts together, using plenty of clamps and ensuring the mitres close properly. Check with a large square and leave the assembly to dry. Once dry trim off any overhang on the sides with a saw, then cut a piece of 18mm MDF to fit inside the bottom and form a base; it will need to be cut to fit tightly around the solid timber components, although the leading edges can be tapered slightly with a hand plane for easier fitting. Apply glue around the edges and tap it in with a mallet or hammer until it is flush with the bottom edge all round. Apply sash or other suitable cramps and wipe off surplus glue, then leave to dry. Once dry, belt sand off any remaining roughness on the edges underneath, then carefully belt sand the edges of the solid sections flush with the ply sides and top of the box. To avoid dig in, use a sander with a sanding frame. The underneath needs no further sanding, but all the tables will need fine sanding later on. Start with the middle 'U' shaped table and ensure your saw is accurately set up for cutting long mitred edges in both planes so that the legs and top will fit together nicely at 90 degrees both from the end and across the 400mm (15 25/32in) depth too. It is sensible to have an extra piece of box section for doing test cuts although you can start by using any piece of board for general checks. This project stands or falls by the quality of the mitres so this is very important. Start with the top first, making sure that the dimension under the top (the inside of the mitre) is 20mm (25/32in) longer than the 'box' centre table. Cut both mitres cleanly and check the squareness of cut across the 400mm dimension. Follow the same procedure for the leg mitres; when one is cut offer it up to the top and check that the joint results in a 90 degree angle between top and leg. Now repeat the operation on the other leg. There should be a small amount of waste at the other end of each leg to be trimmed off to length. Ensure that the leg length allows the underside of the middle table to be 10mm (3/8in) higher than the 'box' table that will sit beneath it. Now machine hardwood strip 15mm (9/16in) thick and the correct width to fit in the bottom of each leg. Cut to length, apply glue and fit. Cramp up and leave to set. Next, make up the 'L' shaped corner inserts that will hold the joints together. Carefully machine the hardwood sections as shown on the plans, to end up with a rectangular piece and a square piece that will then be biscuited together to form the 'L'. Make a strip long enough to be cut into four pieces for both tables, ensuring the size that you thickness to is a snug fit inside the box sections. The biscuit jointer comes into its own here, but the position of the biscuit line is not critical. Use three biscuits per 'L' piece and glue and cramp together for a short while as the biscuits expand. I opted for gluing the 'L' pieces into the top first and leaving to set, so at least part of both joints can be done without mental stress! However, do ensure the 'L' pieces are pushed in properly, and smear glue over the surfaces before assembly so it doesn't get pushed out as you insert the 'L' pieces. Lastly, make sure you remove ALL surplus exposed glue very carefully or the completed joints won't fit together later. You may need help with this stage as you will need plenty of clamps applied in two planes acting on both mitre joints. Don't overtighten the clamps, and also check that the outsides of the mitres are meeting nicely. Place a block of the correct length between the bottoms of the legs to maintain the shape from top to bottom of the whole assembly; try and get the faces at both ends as flush as possible. All this needs to be done quickly as the glue will start setting before you know it, and you may need additional clamps to squeeze the box section together and close the long edges of the mitres. Wipe off surplus glue and leave to dry overnight. This is a repeat of the middle table assembly, from cutting the mitres to final glue-up. Keeping the legs parallel on both tables is critical to how they will look when they are all nested together. Similarly, for appearance's sake it is essential that the tops are set at 90 degrees to the legs. The solid facings may need a few passes of a hand plane to level them, followed by a belt sanding. All faces need proper sanding, preferably with a random orbital or a standard orbital, and a fine grit to remove any belt sander scratches and give a good finish. Use a sanding sealer to seal up and protect the vulnerable light birch ply and prevent it getting dirty. After that you can choose what finish to use but bear in mind that glasses and cups will be put on these tables. A polyurethane varnish is tough but will give a more golden colour. If your spray skills are up to it you could go for precat lacquer. "Use plenty of clamps and cramps but avoid applying too much pressure"
This project demands accuracy in a way that some work doesn't. Any glaring errors in the box sections and mitres will show up when the three tables are nested together so make sure you use a steel rule, an engineer's square and a pair of vernier callipers along with a sharp, hard-grade chisel-tipped carpenter's pencil or a marking knife. Mitre cutting at the best of times is contentious. Mitres look good if well done but can be disappointing if the job goes wrong. For success you need a good pullover mitre saw or a tablesaw with a tilt arbor. Do check that your machine is well set up and has fine enough teeth to give a neat finish. Use test pieces and move the workpiece onto the running blade slightly off your mark, then work up to it to ensure you don't cut off too much! Check the results with a square; if necessary it may be possible to adjust the blade angle past its normal 45 degree position to get the correct bevel angle - don't rely on the manufacturer's scale markings. When trying to achieve a square cut across the board, place a packer against the fence to make a minor cut adjustment. Do not make the critical final cuts until you are satisfied you have made the necessary corrections to your setup. The best way to use a jointer, if possible, is NOT to use the fence supplied with the machine. It is OK and works perfectly well, but remember the bottom of the machine is the most accurate datum surface. Instead, where possible, as with making the 'L' pieces for this project, use a reference board made from a piece of 18mm MDF. Mark up your joints on the top visible surfaces and, resting the jointer on the board, make the slots into both halves of the components. This will result in very accurate fault-free jointing; however, the slot height is of course governed by the position of the blade in the machine. It is possible to use a packing piece under the machine to increase the slot height but this would have to be carefully fixed for accuracy and safety. If you are sawing down a 50mm board to half thickness be careful each half is the same thickness so there is enough left for machining on the planer. Because sawn boards are often not flat or are twisted, cut the boards at convenient places. That way you will lose less material when planing compared to leaving the board surface long.